What Women Want Now is a program by Yahoo Sports and her sister sites dedicated to creating content about the issues and stories that matter most to women. Read more here. When Hailie Deegan insisted her car was too tight and wasn’t handling properly, Bill McNally admits he wasn’t sure whether to believe her. How could a 15-year-old girl driving this type of stock car for the first time already know how to adjust the setup to get the most out of the machine? It was 2017, and Deegan was one of a dozen young drivers auditioning for the chance to join NASCAR’s K&N West Series, traditionally a proving ground for promising teens with aspirations of one day racing at higher levels. Toyota had asked McNally to come to California’s Irwindale Speedway to watch Deegan’s initial outing in a K&N car and assess if she was good enough to join his race team the following year. At first, McNally put a baseline setup in Deegan’s car, the one new drivers often use for months before they get a handle on what works best for them. Only after Deegan asked for changes did McNally follow her instructions and then marvel at the results. Stories like that help illustrate why Deegan might be NASCAR’s best hope of finding the female star it has lacked since Danica Patrick’s retirement last February. The 17-year-old daughter of freestyle motocross legend Brian Deegan possesses the blend of talent, charisma and hunger that NASCAR team owners often covet in a top prospect, regardless of gender. In her debut season driving for Bill McNally Racing last year, Deegan became the first woman to win a K&N Series race, finished in the top 10 in all but two races she started and earned the series’ rookie of the year award. 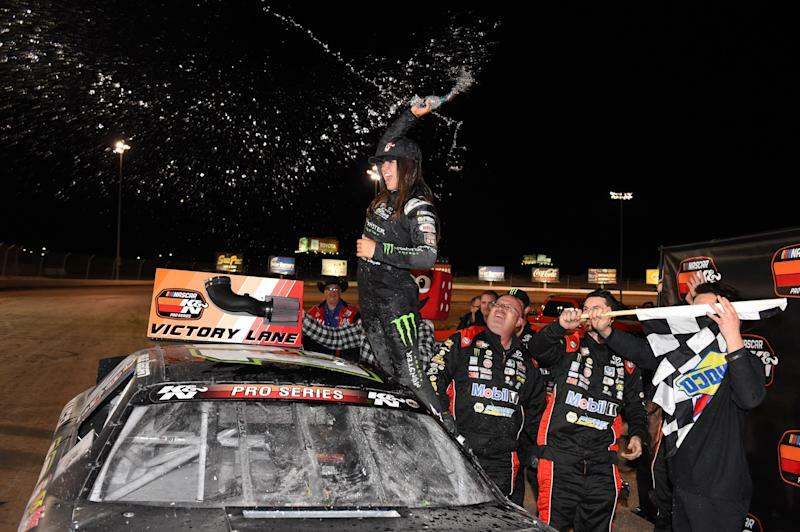 She won again Thursday in the opening race of the 2019 K&N West season, an early boost to her hopes of capturing the overall championship and proving she’s ready to move on to a higher-profile NASCAR series next year. Ask Deegan whether she aspires to be NASCAR’s next Danica someday, and the California native will humbly admit she has even greater ambitions. Deegan believes she has the potential to deliver similar marketing clout as Patrick while also emerging as a Cup Series contender the way her victory-less predecessor could not. Whereas Patrick was already in her late 20s when she transitioned from open-wheel racing to stock cars, Deegan is following a prototypical path from dirt racing to NASCAR’s minor leagues. Her dirt-racing foundation is particularly advantageous as she is accustomed to the absence of traction that occurs when a stock car’s tires get hot running high speeds on pavement and start slipping and sliding through turns. “Danica got thrown into the lion’s den against guys who grew up racing stock cars,” Deegan said. While they aren’t at the same physical disadvantage as women competing with men in other sports, female NASCAR drivers still have struggled to make a real impact. Only three women have started a Daytona 500 and none besides Patrick has ever run full-time in the Cup Series, a product of the sport’s longstanding gender stereotypes and the lack of female drivers talented or persistent enough to break down those walls. When Shawna Robinson was trying to break into NASCAR in the 1990s, she encountered car owners who believed female drivers were too emotionally unstable to succeed and competitors who told her a woman’s place wasn’t behind the wheel. Sponsors also were so clueless about how to market a female driver that K-Mart once dressed her in khaki pants and one of her male teammates’ golf shirts for a photoshoot. It saddens Robinson that NASCAR hasn’t progressed further toward gender equality over the past two decades, but she does believe young female drivers like Deegan have it easier than their predecessors. Deegan is starting her racing career in the post-Danica era, a time when sponsors have already witnessed the mass appeal of a woman competing in a man’s world and are eager for NASCAR to develop another female challenger. It won’t surprise Deegan’s family if she’s the one to do it because motorsports success is the norm in her household. Thirteen-year-old Haiden Deegan is a motocross phenom who has already earned the nickname “Danger Boy.” Eight-year-old Hudson Deegan has been hitting jumps and doing wheelies on his motorcycle since soon after he was old enough to walk. The Deegan children attribute their success in part to the influence of their father. 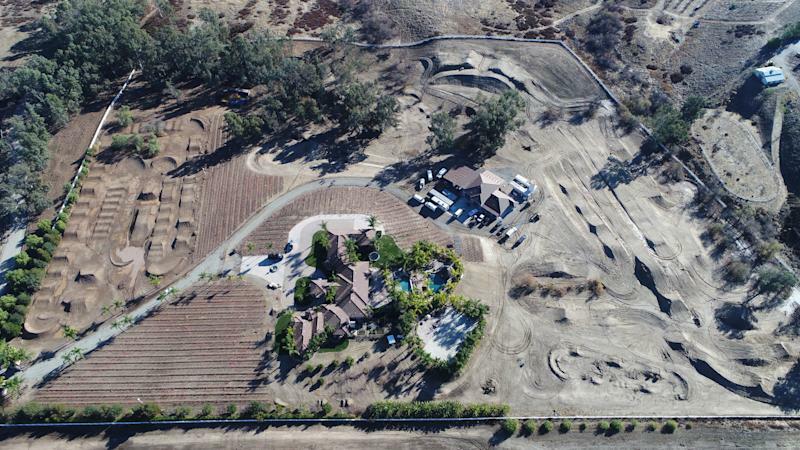 Brian has somehow managed to provide his kids with a sprawling backyard motorsports paradise and top-flight equipment, while also instilling the humility, work ethic and competitive spirit that helped fuel his own ascent a generation earlier. When Brian graduated high school at age 17, he persuaded his father to give him one year to pursue motocross full time before deciding whether to attend college. As a result, Brian left his native Nebraska and headed west on Interstate 80 with nothing but an improbable dream, an old yellow truck, two dirt bikes and a credit card. Taking that massive risk was the catalyst for Brian’s journey from empty-pocketed motocross privateer, to swashbuckling freestyle motocross pioneer, to the most innovative entrepreneur in action sports. Brian generated a massive following and helped popularize the X Games with his fearless stunts and spectacular crashes. As his stature increased, he shrewdly cashed in on his outlaw image by founding the Metal Mulisha, a group of talented but notoriously wild freestyle riders whose rebellious appearances helped spawn a popular lifestyle clothing brand. Landing gravity-defying tricks on his bike might still be Brian’s primary focus were it not for a life-altering 2005 crash that did more than just crack a few bones. Brian lost a kidney and severely lacerated his spleen when he under-rotated a backflip and his handlebars slammed into his midsection while filming for MTV’s Viva La Bam. When Brian woke up after surgery, he says he had “a new appreciation for life.” That meant curbing his careless, thrill-seeking ways, finding a safer competitive outlet and devoting more time and focus to his wife, Marissa, and their kids. An unintended consequence of Brian’s transition to racing rally cars and off-road vehicles was that it sparked Hailie’s interest in motorsports. At age 7, she spotted some older kids racing go-karts before one of her dad’s races and begged her parents to let her do it the following year. For a while, racing was merely a hobby to Hailie, no more important to her than volleyball, Girl Scouts or arts and crafts. Only after she began winning races and contending for championships did she recognize she might have a future in the sport if she dedicated herself the same way her father did. Hailie asked to start homeschooling in seventh grade so she could devote more time to racing. In recent years, she has divided the bulk of her days between strength training and cardio work at the gym, driving at the track and completing schoolwork at home. Growing up in a family of racers has also helped stoke Hailie’s competitive fire. The Deegans compete over everything, from who can expand their social media following the quickest, to who can run faster at the go-kart track. When Deegan isn’t trying to outrun her dad, she’s often working with her driving coach. She has impressed Troy Adams with her desire to learn, whether it’s passing techniques on a short track, how to feel what mechanical changes would improve her setup or when to drive aggressively and when to save tires. One of the passing methods Deegan practiced dozens of times with Adams paved the way for her historic win last September at Idaho’s Meridian Speedway. Deegan passed teammate Cole Rouse on the last lap by executing a textbook bump-and-run, moving her opponent out of the way without spinning him into the wall. Having Adams as a mentor is especially helpful for Deegan because he knows firsthand what it’s like trying to break into NASCAR as a minority. From 1995 to 2002, Troy was one of only a handful of African-American drivers on the NASCAR circuit. Deegan insists she’s comfortable being one of the only female faces at a track, but she has a tougher time when a male competitor races against her differently because of her gender. She felt that’s what happened during a race last year when an opposing driver was so determined not to finish behind a girl that he sent her spinning coming into the last corner of the final lap. Deegan is determined not to let occasional frustrating moments like that derail her from chasing her dreams. By 2021, she hopes to be running full time on NASCAR’s trucks circuit. By 2023, she expects to be a fixture in the Xfinity series. Then if all goes well, she’d graduate to the Cup Series, where she’d have the chance to chase history on NASCAR’s biggest stage. Since Hailie became serious about pursuing NASCAR, she and her father have researched why no female driver has won a Cup Series race before. So far their best hypothesis is that female hopefuls struggled to attain sufficient support before Patrick and more recently have lacked the necessary qualities to take advantage of the newly available opportunities. “You have to have all the right pieces of the puzzle, and I just feel like maybe there hasn’t been a girl yet who has all the right pieces,” Brian said. In Hailie, Brian sees a prospect with the right tools to succeed where others have failed. She has the ideal racing background for NASCAR, the marketability and social media savvy to appeal to car owners and sponsors, the drive to keep pushing to get better and the confidence to thrive as the minority in a male-dominated sport. Hailie’s self-assurance was on display on a rain-soaked night in Daytona Beach last month when she walked into a Waffle House dressed in an unusual outfit. No surprise that Hailie could laugh about the experience. Since she started racing a decade ago, she has grown accustomed to standing out in a crowd.